This year’s annual trip for sunshine and warm rock was to Provence – a change after two years in the Ariege. So no Frankie and Benny’s at Prestwick. We consoled ourselves with a substantive pub lunch before our flight. For some the first challenge after arriving at Lyon was how to get the hire car to move from its parking space. A return visit to the hire car cabin was required before we got the hang of the electronic hand brake control. In a separate incident Martin’s car was spotted in an unusual position at the toll gate. Eventually we all made it to Malacene in the foot hills of Mont Ventoux where our man in Geneva had arranged food and drink. The gite turned out to be rather spacious with roomy bedrooms, acres of garden space, outdoor table tennis and a swimming pool. Definitely not a single kettle venue. After wall to wall sunshine the last two years it was a bit of a blow to have rain on our first day. Some climbing was attempted and quickly abandoned. Martin and Christine made the best decision with a gorge walk and Kenny salvaged the day by walking cross country back to the gite from the abandoned crag. The second day was more of what we are used to. Our man in Geneva employed local knowledge to take us on a strenuous 40 minute uphill walk to our preferred venue in the Dentelles, rather than the usual 15 minute stroll. Harrumph muttered Kenny. It was certainly hot and there was little or no belay shade. As a result, this was to be the first and last day that I was able to wear my “serious” climbing top. The swimming pool was tested out properly that evening with Kenny getting the prize for the quickest ever in and out dip. However, it would be fair to say that apart from Martin nobody went into the pool a second time after their first dip and we stuck to using it as a foot cooler. Tuesday saw us at Baume Rousse, attracted by the description of a crag that has some of the most agreeable bolting that you will ever encounter. No jingo wobbly 747s or coffin symbols to worry about. As a competition venue, it also enabled us to test ourselves against the routes set for the junior girls. Inevitably this meant the crag was quite popular and at one point was akin to a busy evening at Alien rock. In typical EMC style we managed to be the first and last group at the crag. Some excellent routes were climbed by everybody. Fiona R set the pace for the grunt/swear fest of the week on Coleur Embruns, a particularly vicious brown groove. The rest of us did not disappoint but I have to concede that just possibly I edged everybody out as the person making the most noise doing this route. This was also followed by a good demonstration of what not to do when sport climbing. In all the excitement of getting through the crux I failed to clip the next bolt properly. I wouldn’t have mentioned this but as always an EMC member was on hand to photograph the moment. The other highlight of the day was Fiona M’s lead of the 6b+ soleil levante, seconded by Fiona R and Chris. 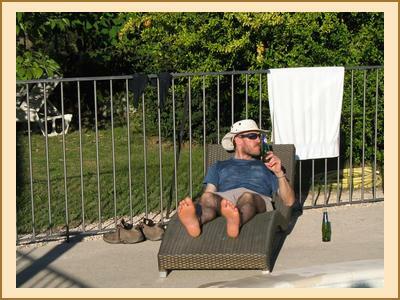 Martin enjoyed an afternoon having an au natural dip in the pool until he was disturbed by the gite cleaner. By Wednesday it was time for multi pitch. 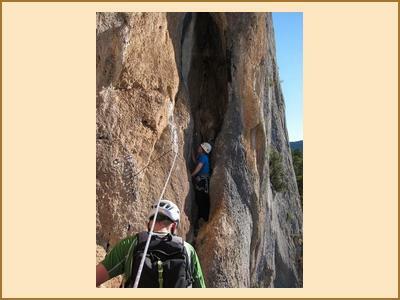 There isn’t quite the range of multi pitch mountain routes in Provence but St Julien sounded like an interesting venue. An early start saw three teams first at the crag. Fiona M, Chris, Kenny and I headed up Pilier Gris, 5+ and La Guepe Normale, 5+. After we left the car park there was no sign of the others but half way up our climbs the crag echoed with the sound of blood curdling screams. The actual words were hard to make out. It sounded a bit like “SLAAAAAAAAAAAAAAAAAAAAAAAAAAAAACK” and various combinations of this prefaced by other commands. After a while there was silence. It turned out that the guidebook suggestion of combining pitches 2 + 3 of the classic 6a climb, La Grotte was not such a good idea and Fiona R ended up doing a delicate 6a traverse with rope drag from hell, all out of sight of her belayer safely ensconced in the cave below. All ended well as Fiona made it through the pitch with only a sore throat to recover from. Armed with this beta the rest of us later enjoyed a 4 pitch ascent of La Grotte which really is an absolute classic and must be one of the best multi pitch sport routes of its grade. For good measure Fiona and Chris sneaked in another 4 pitch route. Meanwhile, Sara and Pete opted for slightly less excitement on one of the excellent mini crags at the Dentelles. Talking of sore throats, the Provence cold was starting to take hold and Chris decided it was time to move out of the snorers den and sleep al fresco bed under the stars. Thursday was another day at the main Dentelles, this time using the convenient parking area and having a short walk to the crag. The bolting at the Dentelles is a little more sporting than other areas and some of the big slab routes did feel a bit out there. It was another long day climbing and maybe doing just one more route than was sensible. With Fiona and Chris on cooking duty this meant a further drive back to Buis Les Barannois for them to get the coveted rotisserie chickens – perhaps I can now confess that the little supermarket in Malacene that Kenny and I were dropped off at did in fact stock the chickens………It seemed a good idea not to mention this at the time. Friday was the last full day of climbing. Where had the week gone? Martin made an appearance at the crag and more high quality routes were climbed at our first day venue - Baume Rousse including our favourite “ideal for unfit lardies” route. Excuse of the day came from Sara who refused to continue her route due to a wasp’s nest on the crucial hold. Saturday was airport day. For some that meant a bit of sightseeing. The rest of us managed a morning at the local crag. Most of the crag is super hard but there was a small selection of easier routes which packed quite a punch in contrast to a week of slabby stuff. This left just enough time for an adrenalin filled journey to the airport with a major accident blocking the motorway and long tail backs. Ewan took Kenny back home via Geneva so that Kenny could climb the highest summit in the Jura Alps and just to make sure that he would catch the Provence cold . So another good trip – where to in 2013 is the question.